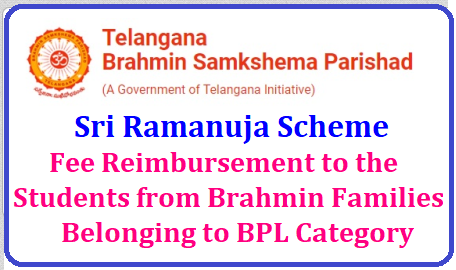 Sri Ramanuja Scheme - Fee Reimbursement to the Students from Brahmin Families Belonging to BPL(Below Poverty Line) Category. Fee reimbursement to the students from Brahmin families belonging to BPL (Below Poverty Line) category. This scheme is applicable for Brahmin students of Telangana State covering all 31 districts, who are studying Post Metric courses i.e., Intermediate/ equivalent onwards for the academic year 2018-19. The student and his/her parents should belong to Brahmin community and parents should reside in Telangana State. Annual Family income of Parents / Guardian should not be more than Rs.2,00,000/- (Rupees Two lakhs only) in Urban area andRs.1,50,000/- (Rupees One Lakh Fifty Thousand only) in Rural areas. Should be pursuing a regular course in College/ Institute / University for the year 2018-19. Should have passed in all the subjects till previous year of study (i.e., students who do not have backlogs in their previous semesters / years are only eligible). 1. Passport size photograph (in .jpeg format of maximum of 50kb size). 6. Consecutive 7 years study / bonafide certificates from 4th standard onwards. critically determines as to know whether a student is a local candidate or not.